In codelab MDC-101, you used two Material Components (MDC) to build a login page: text fields and buttons with ink ripples. Now let's expand upon this foundation by adding navigation, structure, and data. 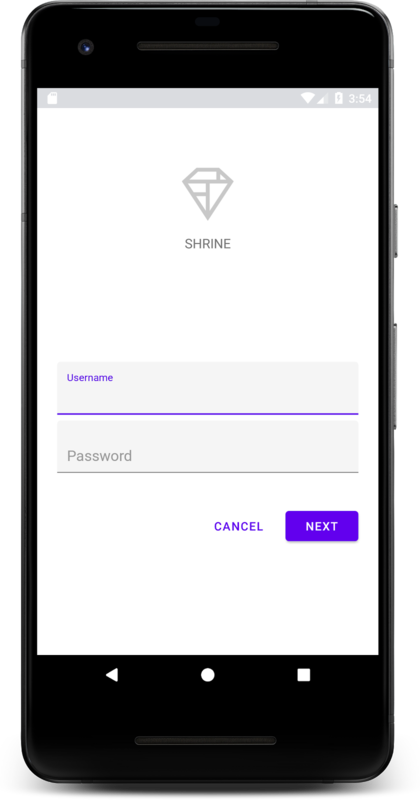 This is the second of four codelabs that will guide you through building an app for a product called Shrine. We recommend that you do all of the codelabs in order as they progress through tasks step-by-step. In this codelab, you'll use the default components provided by MDC-Android. You'll learn to customize them in MDC-103: Material Design Theming with Color, Shape, Elevation and Type. If you completed MDC-101, your code should be prepared for this codelab. Skip to step 3: Add a top app bar. 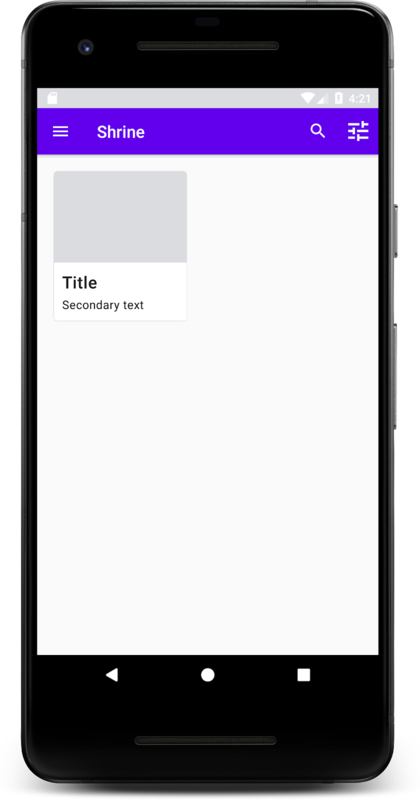 The starter app is located in the material-components-android-codelabs-102-starter/kotlin directory. Be sure to cd into that directory before beginning. Once the setup wizard finishes and the Welcome to Android Studio window is shown, click Open an existing Android Studio project. Navigate to the directory where you had installed the sample code, and select kotlin -> shrine (or search your computer for shrine) to open the Shrine project. Success! You should see the Shrine login page from the MDC-101 codelab. Now that the login screen is looking good, let's populate the app with some products. Many app bars have a button next to the title. Let's add a menu icon in ours. You can also add buttons to the end side of the app bar. In Android, these are called action buttons. Start and end are terms that express direction, referring to the beginning and ending of text lines in a language-agnostic way. When working in an LTR (left-to-right) language like English, start means left and end means right. In an RTL (right-to-left) language like Arabic, start means right and end means left. We will style the top app bar and add action buttons to its menu programmatically. In ProductGridFragment.kt's onCreateView function, set the activity's Toolbar to be used as an ActionBar using setSupportActionBar. You can do this after the view has been created with the inflater. Important: Make sure to import kotlinx.android.synthetic.main.shr_product_grid_fragment.view.*. 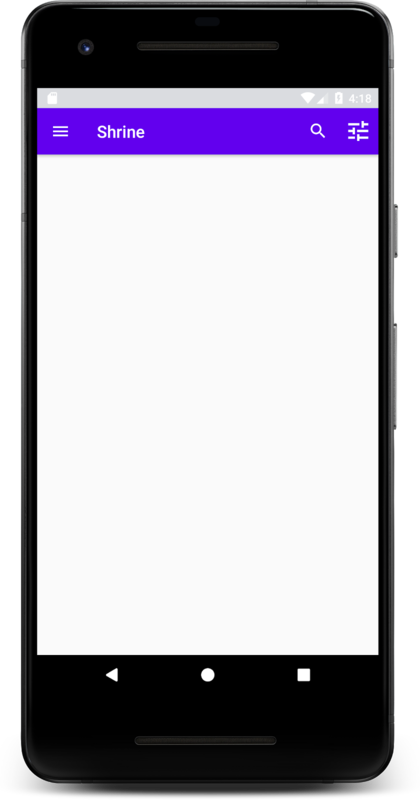 This will allow us to access the view with id app_bar by using kotlin's synthetic properties, rather than by using findViewById. Throughout the codelabs, you can continue to add import statements when prompted by Android Studio. The above code snippets set the app bar from our XML layout to be the Action Bar for this activity. The callback onCreateOptionsMenu tells the activity what to use as our menu. In this case, it will put the menu items from R.menu.shr_toolbar_menu into the app bar. The menu file contains two items: "Search" and "Filter". Now the toolbar has a navigation icon, a title, and two action icons on the right side. The toolbar also displays elevation using a subtle shadow that shows it's on a different layer than the content. You'll notice the status bar along the top looks slightly generic. Don't worry about that for now, because we will correct that when we do color-theming in MDC-103. Now that our app has some structure, let's organize the content by placing it in cards. Let's start by adding one card underneath the top app bar. A card should have a region for an image, a title, and a label for secondary text. Add the following in shr_product_grid_fragment.xml underneath the AppBarLayout. In this preview, you can see the card is inset from the left edge, and it has rounded corners and a shadow (which expresses the card's elevation). The entire element is called the "container." Aside from the container, all of the elements within it are optional. You can add the following elements to a container: header text, a thumbnail or avatar, subhead text, dividers, and even buttons and icons. The card we just created, for instance, contains two TextViews (one for the title, and one for secondary text) in a LinearLayout , aligned to the bottom of the card. Cards are usually shown in a collection with other cards. In the next section of this codelab, we'll lay them out as a collection in a grid. When multiple cards are present in a screen, they are grouped together into one or more collections. Cards in a grid are coplanar, meaning they share the same resting elevation as one another (unless picked up or dragged, but we won't be covering that in this codelab). This card layout contains a card with an image (in this case, a NetworkImageView, which allows us to load and show images from a URL), and two TextViews. Next, look at the ProductCardRecyclerViewAdapter we've provided for you. It's in the same package as ProductGridFragment. * Adapter used to show a simple grid of products. The adapter class above manages the content of our grid. To determine what each view should do with its given content, we will soon write the code for onBindViewHolder(). In the same package, you can also take a look at ProductCardViewHolder. This class stores the views that affect our card layout, so we can modify them later. The above code snippet contains the necessary initialization steps to set up a RecyclerView. This includes setting the RecyclerView's layout manager, plus initializing and setting the RecyclerView's adapter. The cards are there now! 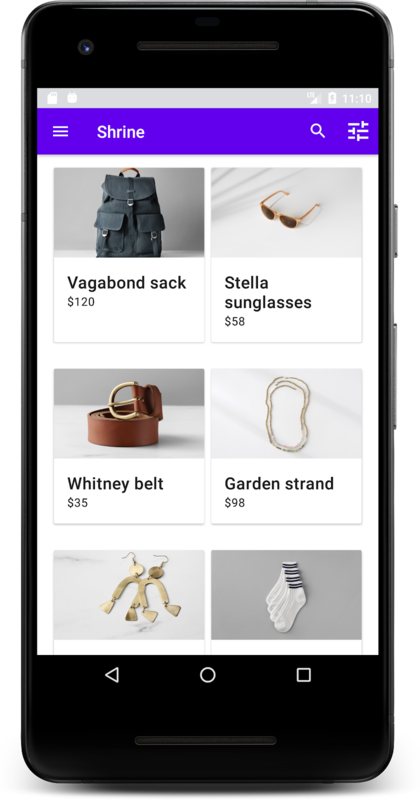 They don't show anything yet, so let's add some product data. For each card, add an image, product name, and price. Our ViewHolder abstraction holds the views for each card. In our ViewHolder, add the three views as follows. The above code tells our RecyclerView's adapter what to do with each card, using a ViewHolder. Here, it sets the text data on each of the ViewHolder's TextViews, and calls an ImageRequester to get an image from a URL. The ImageRequester is a class we've provided for your convenience, and it uses the Volley library (That's a topic outside the scope of this codelab, but feel free to explore the code on your own. Our products are now showing up in the app! Our app has a basic flow that takes the user from the login screen to a home screen, where products can be viewed. In just a few lines of code, we added a top app bar with a title and three buttons, and a grid of cards to present our app's content. Our home screen is now simple and functional, with a basic structure and actionable content. The completed MDC 102 app is available by downloading the finished codelab, or by checking out 102-complete with git: git checkout 102-complete. You can test your version of the app against the app on that branch. 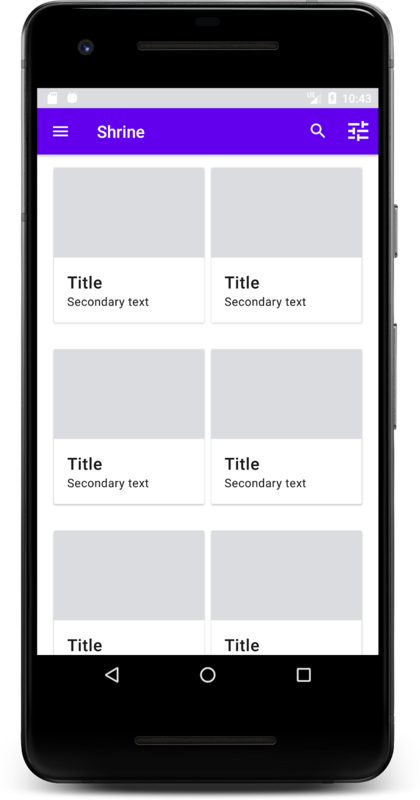 With the top app bar, card, text field, and button, we've now used four core Material Design components from the MDC-Android library! You can explore even more components by visiting the MDC-Android Catalog. 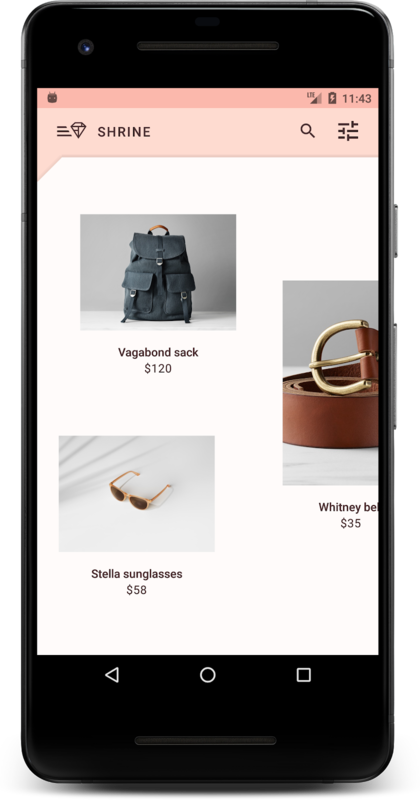 While it's fully functional, our app doesn't yet express any particular brand or style. In MDC-103: Material Design Theming with Color, Shape, Elevation and Type, we'll customize the style of these components to express a vibrant, modern brand.